OS grid reference SD 8930 4801. 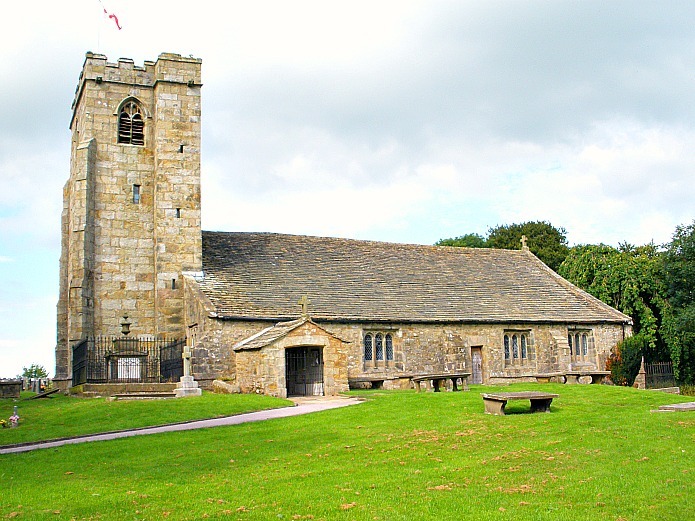 The picturesque St Mary-Le-Gill Church near Barnoldswick is something of a hidden gem that can be found up Ghyll Lane, (often spelt as ‘Gill’) off the B6252 Skipton road, at Coates, about 1 mile north-east of the town that used to be a part of west Craven or north Yorkshire uptil 1974, but is now in Lancashire, just about! The hamlet of Greenberfield with the Leeds and Liverpool canal running through it is half a mile west of the church, while the town of Skipton is about 8 miles to the north-east on the A56 and A59. The name Gill (Ghyll) is the Yorkshire name given to the stream, in this case Gill Syke, that runs southwards from the churchyard and cemetary along the western edge of Ghyll golf course towards Rainhall, while the place-name ‘Coates’ probably means “cottages” – Coates being a grange/farm of Sawley Abbey near Clitheroe. A Norman foundation, there was a monastic church on the site in 1157, built by Cistercian monks from Kirkstall Abbey near Leeds, west Yorkshire, some 10 years after another group of Cistercian monks from Fountains Abbey in north Yorkshire had tried unsuccessfully to sustain a foundation in the area, but they had failed due to the ‘very’ inclement weather conditions encountered there along with other problems. In the book Medieval Monasteries of Great Britain by Lionel Butler and Chris Given-Wilson, the authors say: “the land was unproductive, however, and the community was plagued by robbers”. The land for a small abbey had been granted to 13 monks and 10 laybrothers from Fountains Abbey under abbot Alexander in 1147 – by Henry de Lacy, Earl of Lincoln, but by 1152 the foundation had been abandoned and left to decay. In the book ‘Outstanding Churches in Craven’ by Val Leigh and Brian Podmore – the authors add a comment from one of the monks saying: “We stayed there for some years, suffering many discomforts of hunger and cold, partly by reason of the inclemency of the air, and immoderate plague of waters, partly because of the Kingdom being disturbed, robbers many times wasted our goods”. The Cistercian abbey of Kirkstall near Leeds was founded in 1152 by the monks who had left Barnoldswick. A few years later, apparently, the Pope decreed that the monks must build a church ‘as a replacement’ at ‘Bernulfswic’ because they had failed to keep their abbey going there. However the monks, maybe out of malice, decided to build the church dedicated to St Mary about one-and-a-half miles from the original site of their failed abbey, which was located on the western edge of the present town at Monkroyd (Townhead). There are no remains, only slight earthworks there today. More likely they sited the church on ‘St Mary’s Mount’ at Ghyll to provide a place of worship between Bernulfswic, Marton and Thornton-in-Craven as a kind of atonement ie penence. In the excellent book ‘Journeys Through Brigantia’ (vol 1) Walks in Craven, Airedale and Wharfedale, by John* and Phillip Dixon – the authors say: “And indeed what a place for quiet reflection this churchyard is amid the willow-herb, brome, wild-thorn and old English rose that play for space among the tangled stones”, a statement that I like because I think ‘that’ more or less sums up the place as you walk up through the lovely churchyard – when the place has been left alone for some considerable time, but just as nice when the grass and foliage has been cut back as was the case when I visited. The Perpendicular church tower of the present-day building looks very grand, dating from the early 16th century, while nothing much remains of the 12th century Norman foundation, apart from an arch above an inner door; there is an inscribed stone on the south wall of the tower that reads: CCCCCXXIIII that should have read 1524 but the ‘M’ is missing! Outside, at the side of the porch, there is a medieval stone coffin that is now full of soil. This may have once contained the body of one of the monks who came here to help build the church or the abbey. Inside the church much of the timbered roof dates from the 13th century, while the font with Jacobean canopied-cover is 14th century; at the side of this there is a nice Medieval holy water stoup (piscina). In the sanctuary (north wall) stands the credence table, carved with three swords in fess, representing the arms of Kirkstall Abbey and it’s monks who came back to build the church. The wooden three-decker pulpit is of 1620 and above it an octagonal sounding board. Notice the south door which has a beam that would have been placed across the door during invasions by Scottish armies, keeping the local people who were taking refuge, secure. Above the door is the 12th century Norman arch, the last reminent perhaps of the 12th century Norman foundation. The dark oak box pews date from the 17th century, and there is a wardens’ and constable’s box-pew in the south aisle. There are many interesting old gravestones in the churchyard, two of which date from the early 17th century, and are well-embedded into the ground. There are a number of prehistoric settlements and earthworks in the area and a number of finds have come to light in recent times; a Bronze-Age sword was found here at Ghyll, and several Celtic stone heads have been discovered within a few miles, including one at Great Hague house, Kelbrook, and also a Bronze Age collared urn was dug up at nearby Hare Hill, Thornton-in-Craven, according to John* and Phillip Dixon in their work ‘Journeys through Brigantia’ (vol 1). *[This site page is dedicated to the memory of my dear friend and author John Dixon, of Clitheroe, who very sadly passed away in September 2012]. *Dixon, John & Phillip., Journeys through Brigantia (Vol 1) Walks in Craven, Airedale and Whafedale, Aussteiger Publications, Barnoldswick, 1990. Leigh, Val & Podmore, Brian., Outstanding Churches in Craven, Bradford Diocesan Board of Finance in conjunction with Val Leigh Publications, Settle, North Yorkshire, 1985. Butler, Lionel & Wilson-Given Chris., Medieval Monasteries of Great Britain, Michael Joseph Limited, London, 1979. Categories: Abbey or Priory, St Mary-le-Gill Church at Barnoldswick in Lancashire | Tags: St Mary-le-Gill Church near Barnoldswick in Lancashire | Permalink.